Council members Faulconer and Gloria proclaimed today, February 28th, “Senior Transitional Housing Day” in the City of San Diego. After the proclamation I took a moment for our flip camera. Paul invites Pei-Chen Emily Wu, Psy.D., Program Manager of UPAC Positive Solutions Program, to share the collaborations between UPAC and SCC in serving seniors who are homebound or socially isolated. In Fiscal Year 2010-2011, PSP has its first full year outcome. 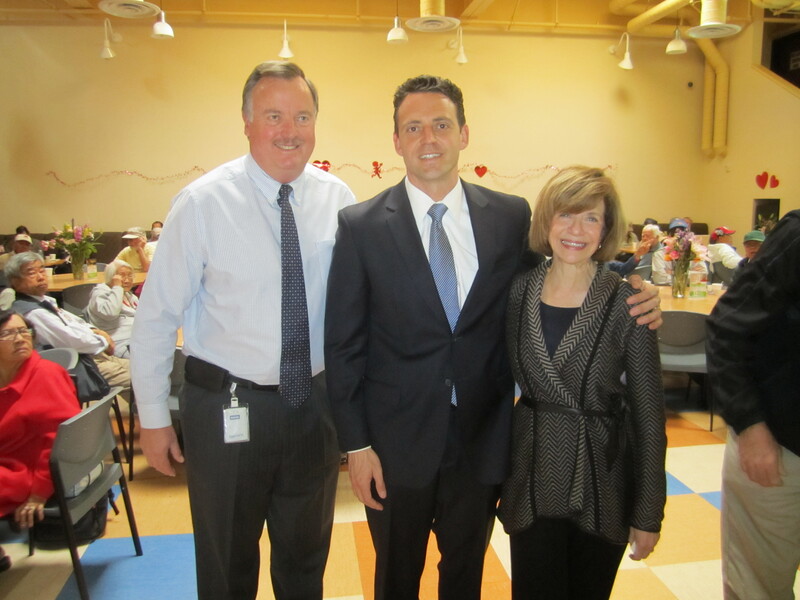 We were delighted to host Assemblymember Nathan Fletcher for a visit with Senior Community Centers. He is the third major candidate running for Mayor of San Diego to visit our Gary and Mary West Senior Wellness Center. So far, City Councilmember Carl DeMaio and Congressman Bob Filner have visited. District Attorney Bonnie Dumanis visits this week. These visits provide an excellent opportunity to discuss aging policy issues that impact the City of San Diego. Assemblymember Fletcher outlined key issues from his perspective facing the City. He also spent considerable time listening to concerns from seniors and answering their questions. Also, look for a major announcement in the near future regarding Senior Community Centers and the Mayor’s race. . .
Did you see me on NBC Money Matters? It is a show hosted by veteran broadcast/print journalist George Chamberlin that airs on Saturday at 6:30pm on 7/39. George asked some good questions about aging baby boomers, senior employment and the “impact” of Senior Community Centers keeping seniors healthy and independent. 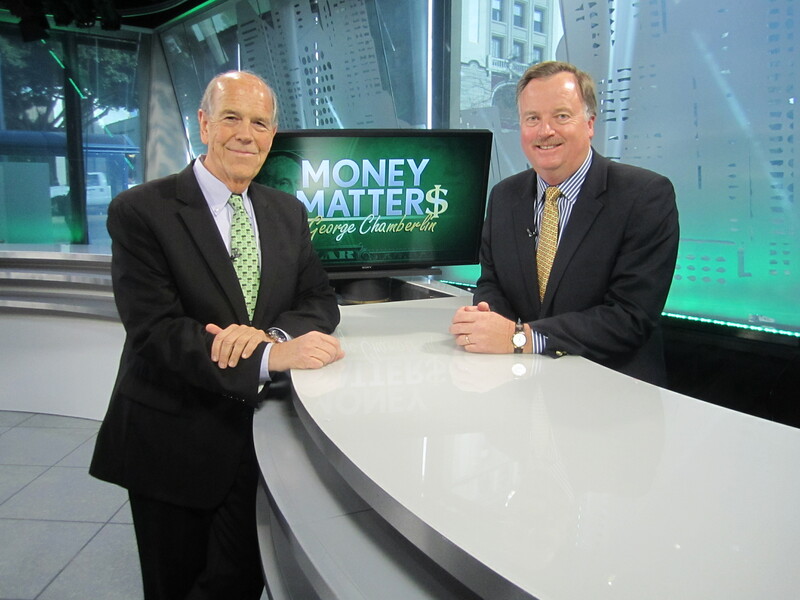 Filming my segment for Money Matters with George Chamberlin airing 6:30pm on Saturday. The last few months I’ve spent time presenting to civic-minded groups, groups like Southeast San Diego Rotary and San Diego Coastal Rotary, on the “graying of America” and the resulting aging policy implications. The number of seniors will double in the United States by 2030 to more than 80 million, including 700,000 here in San Diego. As a community and a country, we have an opportunity to prepare properly for this seismic demographic shift. Our workforce. As our population ages, so does the work-force. The first round of Baby Boomers began reaching the traditional retirement age of 65 last year. Employers will need to look at retaining older workers through flexible schedules or job-sharing. We can’t afford to have large number of workers retire because there won’t be enough people to take their place; and we’ll need folks to continue paying into social security. Housing/Development. Nearly 42 percent of older adults do not have enough income to meet basic needs, including housing. * The loss of redevelopment funding will have a chilling effect on the development of new affordable housing in California. No demographic will be more impacted that low-income seniors. New housing policies and funding sources must be identified to stimulate affordable housing construction to meet the demand. Transportation. It is no surprise that as we age, so does our dependence on transportation. For those seniors who either don’t or can’t drive, public transit is often their only means to get to doctors appointments, social outings or to eat at congregate meal sites, like the Gary and Mary West Senior Center. This means investing in public transit innovation that will meet the needs of an aging population. We have the opportunity right now to begin addressing these issues. The alternative is to simply wait until aging issues become crises and deal with them in panic mode — a really poor way to create significant public policy.